This past Sunday my husband, son and I enjoyed visiting the recently opened Upper Room at Wilson Creek Winery. 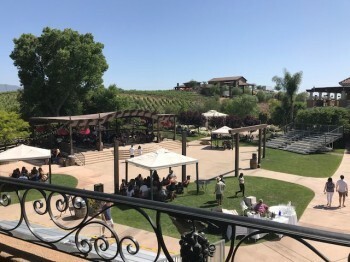 The winery, located almost at the end of the Rancho California Wine Trail in the Temecula Valley Wine Country, is widely known for its popular and delicious Almond Champagne. Along with the Upper Room, the winery offers beautiful grounds, picnic areas, banquet facilities, the Creekside Grille, and the Wilson Manor (a luxurious event and accommodations venue). The Upper Room sits atop the winery’s fun and lively grand tasting room and is a welcome addition to the many amenities the property offers. 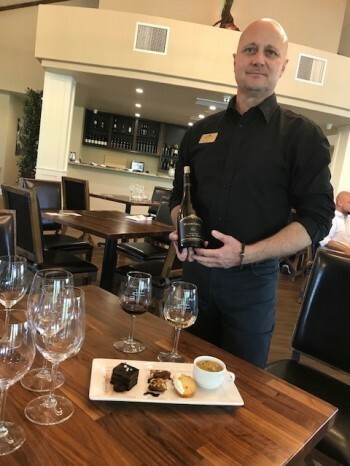 The Upper Room is a VIP experience like no other in the Temecula Valley—providing a one-hour, sit-down guided tasting of premium wines, paired with creative, seasonal small bites designed exclusively by Wilson Creek’s executive chef. On this beautiful spring afternoon, we arrived at our reserved time and were welcomed by a friendly staff. The spacious room is elegant and contemporary, with a rustic-chic feel, and boasts a large vaulted ceiling. It is light and open with an abundance of windows for enjoying the beautiful views of the grounds and surrounding vineyards. After promptly seating us, our server, AJ, was attentive and knowledgeable about the wines and appetizer pairings that we were about to sample. We began with a 2016 Estate Viognier, a white, crisp wine with subtle flavors of peach, green melon, and a hint of tangerine. This selection was supremely paired with a skewered jumbo tiger shrimp atop chimichurri aioli. A squeeze of fresh lime added just the right amount of citrus to each delightful bite. The flavors perfectly complemented one another. 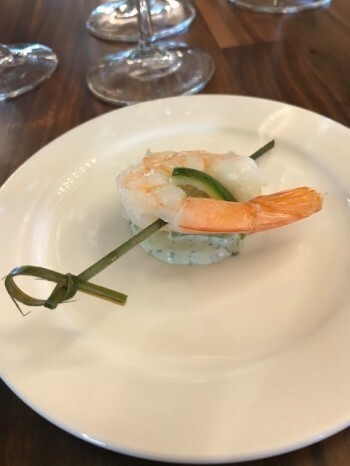 Next, we were presented with a trio of delectable bites to pair with the three uncoming red wine selections. First up was the 2013 Family Reserve Syrah with cedar and spice prominent in the aroma, and cherry and sour plum on the palate. The Syrah was paired with Cream of Mushroom Soup, served in an espresso cup alongside two Fromage Blanc Crostini. The savory goodness of the soup nicely complemented the dark fruit flavors of the Syrah, and the crostini added just the right crisp texture. This delicious soup was followed by Walnut and Bleu Cheese filled Dates drizzled with a balsamic reduction, which we enjoyed along with the 2012 Family Reserve Zinfandel. Presenting layers of berry and spice, this full-bodied red wonderfully complemented the richness of the Bleu Cheese with a smooth finish on the palate. Our server expertly provided tasting notes along the way, explaining the aromas and flavor nuances for each wine. Lastly, and my personal favorite, we enjoyed the Sparkling Shiraz. 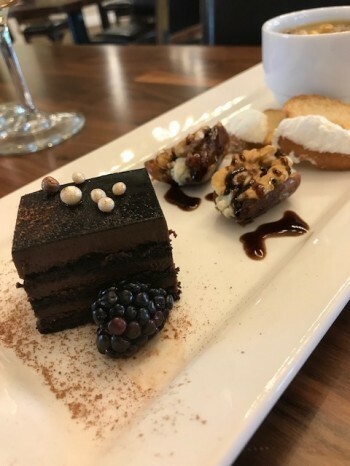 Displaying a rich garnet color with flavors of raspberry, strawberry and plum, it paired deliciously with the Chocolate Ganache Cake served with fresh blackberries. This jammy sparkler has just the right hint of sweetness to complement the decadent chocolate of the moist, creamy cake. This heavenly ending was the perfect grand finale to our tasting experience. Temecula is fast becoming a premier Southern California wine destination. The Upper Room at Wilson Creek Winery with its high-end wine and food tasting experience, coupled with great service and beautiful surroundings, is a must-visit whenever you are spending time in the Temecula Valley Wine Country. Wilson Creek Winery is located at 35960 Rancho California Rd. in Temecula, California. The Upper Room hours are Thursday through Sunday from 11:00- 4:00 pm. Reservations are for adults only and are $40 per person ($20 for wine club members). Call 951-699-9463 for reservations.